Prada introduces Les Infusions de Prada this month. The fragrance collection includes the original Infusion d'Iris from 2007, plus two reissued flankers, Infusion de Fleur d’Oranger (2009) and Infusion de Vétiver (2010). Also included will be three new fragrances, all from perfumer Daniela Andrier: Infusion d'Iris Cèdre, Infusion d'Amande and Infusion d'Oeillet. Infusion d'Iris Cèdre ~ with iris, cedar, neroli, benzoin and incense. Infusion d'Amande ~ with bitter almond, heliotrope, anise, tonka bean and musk. Infusion d'Oeillet ~ with mandarin, carnation, sandalwood, styrax and patchouli. 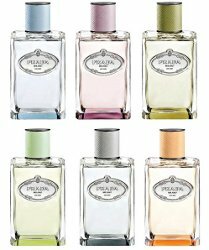 Les Infusions de Prada will be available in 100 ml. Update: the Infusions collection is not expected to launch in the US until early 2016. They will be in 100 ml only, and will not be as widely distributed as some Prada fragrances (like Candy). Oh my. I want the Cedre. I am trying to keep in mind that I haven’t liked a single one of the non-iris flankers so far…but I’d like to try all of them. I kinda liked the Vetiver one, though not nearly enough to buy it. Me too, although like Robin, I didn’t like the flankers at all. A personal pet peeve of mine is when non-French design houses use French for their fragrances. I understand that the house usually doesn’t do their own fragrances but still. Anyone else feel similarly? Agree. Didn’t like rose or vetiver either. And no, don’t care…French is the language of perfume, for better or worse. But I know you’re not alone! I wonder if Iris Cedar is similar to the ex-Infusion D’Homme? Was the men’s officially discontinued? Darn, these looked really cute until I saw they were 100ml each… how about a coffret of 15ml, or even 30 ml each? Well, not that I’m tempted by these, except the Amande, but a coffret of small bottles would just make SO much more sense. I have only seen one for sale so far — the Iris Cedre is at El Corte Ingles. I say that because maybe when they launch, we’ll find there are more sizes. But also won’t surprise me if there aren’t, since there are so many of them. I think the Hermes 4x15ml box concept makes so much sense. It’s the only reason I own so many of their scents. I’m not going to get my hopes up but I will try to sample the almond one just in case. I’ve never yet loved a Prada. The almond one calls out to me, too. Can anyone confirm whether Infusion d’Homme is officially discontinued? Yes, it is. This is what I’ve been told by Paris rep.
Reps tend to not know anything beyond the store that they work in, and more often than not will say something is discontinued when it is simply not in stock. In my experience, if something is still being sold on the official website(as Infusion D’Homme is on Prada’s website) it is not discontinued. Okay, thanks for the caution, Rictor. I have heard salespeople claim something is discontinued if their shop has decided to not stock it anymore. Oh boy, my Cuir Beluga may have some competition! It is launches like this that prevent me from making a serious effort at keeping my New Year’s Resolutions. Although, now that I think about it, mine were related to shower gels and other bath products. Therefore, i want d’Oeillet, Iris Cedre and d’Amande! The carnation got my attention too – but with caution. Sometimes the musk in the base of the infusions gets to me after a while. Y to the E to the S. YES. Carnation is my second most favorite and elusive Great White Flower of perfumery, after Jasmine. I will take Cedre and Oeillet please, thank you. The Cedre is the one I’m eyeing too. I spent weeks deciding between the regular and the d’Homme version. They are so similar! The women’s version won out. So far the iris and the iris absolue are the only ones I’ve enjoyed from this line but the cedre is calling to me… I’m intrigued by the almond one too. Gotta sample! By the way…what is happening to the Infusion d’Iris Edt? Hoping I’ll be able to find these near me to try. The Amande and Oeillet ones have me interested. It looks like the men’s version has gone away — or maybe just nominally so (perhaps it continues as the Cèdre?). It looks like they are positioning the entire line as more or less unisex à la the Eau de Cartier range, which is interesting because I’ve always felt Eaux de Cartier and Les Infusions filled the same sort of niche for me, even if they aren’t superficially similar. I am still trying to find these. Bloomingdales, SAKS and Bergdorf’s in NYC still don’t not have them. Any word on their release in the states? Neimans just got the original Infusion d’Iris in the newer packaging, so hoping that is a good sign, but really that is all I know.